Warner Brothers and Premiere Cinemas have announced the time and date for the highly-anticipated Hobbit MOVIE MARATHON at Lubbock's Premiere-IMAX. 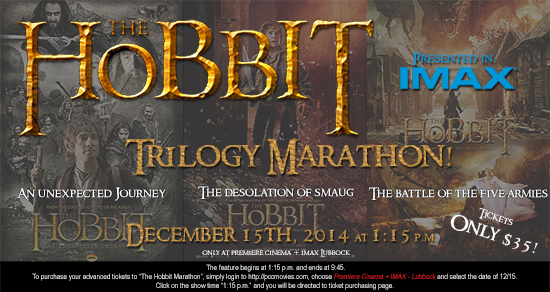 Audiences will have the rare opportunity to see the new Hobbit movie two days before its national release! The 3-movie MARATHON is set for Monday December 3rd, with the first Hobbit movie, "An Unexpected Journey" starting at 1:15 p.m., followed by "Desolation of Smaug", then followed by the world premiere of the new and final chapter "The Battle of Five Armies". All movies in the marathon are being presented in Premiere's massive IMAX theatre in 3-D.
"It's an exciting day for Lubbock for sure," said Rudy Leal, Director of Lubbock Premiere. "We will be serving special food menu items and drinks all day long to keep our audiences refreshed and well-nourished for sure!" Audiences won't go hungry, as the theatre features a full-service restaurant and bar serving gourmet pizzas, burgers and local favorites, along with both an upstairs and downstairs seating areas. Premiere also has Starbucks and BlueBell ice cream bars. Audiences can order food and it will delivered directly to the theatre. "We expect a sell-out as there is a lot of anticipation surrounding the final chapter," said Mr. Leal. "We've already started selling tickets." Tickets are available at the box-office or online at Premiere Cinema + IMAX - Lubbock.